Once just a tiny fishing village on the north coast of Fuerteventura, Corralejo's harbour now receives ferries full of day-trippers from Playa Blanca in Lanzarote every day of summer, and the town plays host to hundreds of holidaymakers who are drawn to spend a sunny, sandy holiday in the island's largest resort. Although tourism is booming and development is keeping pace, the little port still retains its charm. The fishing village as was is now surrounded by apartments and hotels, and the waterfront promenade is lined with cafes and restaurants. 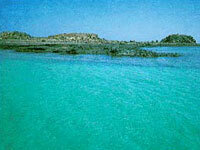 Just outside the resort is a protected nature reserve boasting miles of undulating sand dunes. The surrounding beaches are more than inviting and visitors to this Spanish resort town are spoilt for choice: the sheltered Playa la Clavellina, just near the harbour, is perfect for windy days; Playa del Medano, which joins to Playa de Viejo, is lovely; Playa del Pozo, located just outside of Corralejo, is popular with nudists; and Flag Beach, fronting the main hotels, is a great venue for kitesurfing and windsurfing. The spacious sandy stretches ensure that the beaches don't feel too crowded despite the area's popularity. Corralejo is not a bad shopping destination, if you can drag yourself off the beaches and out of the restaurants. The main street, Calle General Franco, is flanked with shops selling everything from radios to surfboards, and sunscreen to luxury watches. There is a good craft market on Saturdays at the Caleta de Fuste where tourists can bargain for souvenirs. While in Corralejo, recommended eateries for holidaymakers include El Bribon, The Point Restaurant, El Pescador and the Taverna Los Piratas Bar Tapas. Individual eateries may come and go, but the waterfront promenade boasts numerous restaurants and cafes, many in charming converted historic houses, and as the resort expands the variety only increases. Corralejo's restaurants offer a wide choice, from good old English fish and chips to Mexican tacos or Indian curry. 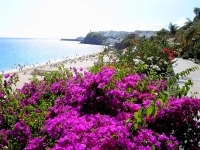 There is also a smattering of eateries serving up traditional Canarian cuisine and fresh seafood. Most of the bars and restaurants in Corralejo are on the main street, Calle General Franco. There is a variety of bars and clubs, with everything from sports bars and karaoke to dance clubs and live music venues. The high street and town square have a number of quieter restaurants and lounges. The clubs close around 1am, but the bars often stay open later. Grab a copy of the free Fuerteventura Grapevine magazine for event listings and a nightlife guide. 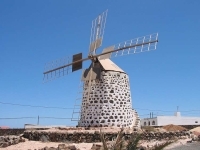 Among the activities to keep holidaymakers busy in Corralejo are a variety of water sports, tennis, glass-bottom boat trips, ferry trips to Lanzarote, jeep safaris, island tours, mountain biking and motorcycle tours. The Baku Waterpark and Golf complex is centrally located. 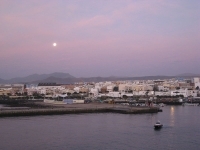 Corralejo can be quite expensive and travellers on a budget should take this into account before booking a holiday. Families should be aware that the beach area around Playa de Pozo is popular with nudists, and that there are sometimes strong ocean currents.